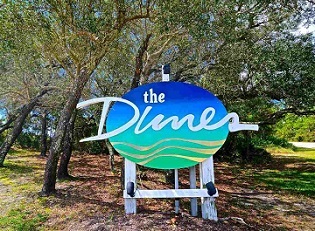 The Dunes condominium home for sale in Gulf Shores Alabama. Nestled high on top of the dunes, this turn key unit features Gulf views on the huge balcony. The sunsets will take your breath away. bring Fido - pet friendly for owners and renters! Bright and open floor plan offers high ceilings, floor to ceiling glass, and plenty of room to relax and soak in the beautiful views of the Gulf and dunes. Luxury master includes stylish tropical decor with private en suite bathroom and view toward the bay. Bunk room is fun and the perfect place for a restful night sleep with it's own dedicated hall bath. Large entry foyer and full size washer dryer for that added convenience Spend your days at the dedicated beach that is a quick stroll or taking a dip in the indoor or outdoor pool. Great rental with annual income at $30k +/-. Private and just off the beaten path, yet minutes to restaurants, attractions, marina, and MORE. Amenity extras include fitness center, indoor pool, outdoor pool, bbq area, gated.